Thoth was the god of the moon, sacred texts, mathematics, the sciences, magic, messenger and recorder of the deities, master of knowledge, and patron of scribes. 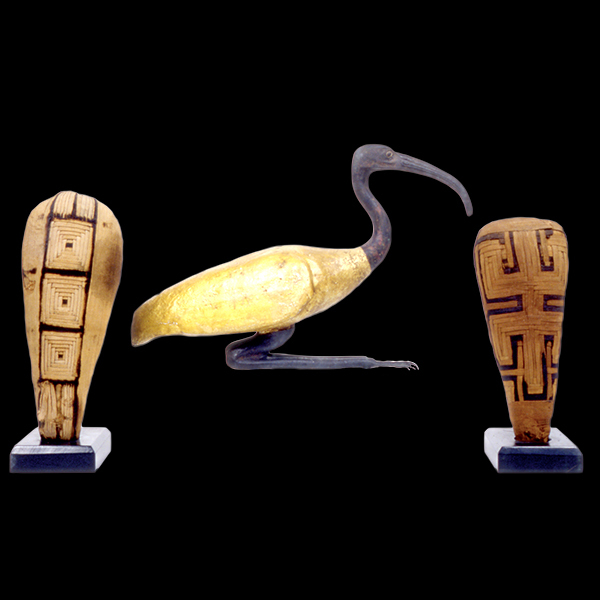 His Egyptian name was Djehuty, which means “He who is like the Ibis.” He was depicted as an ibis bird or a baboon. According to one story, Thoth was born from the lips of Ra at the beginning of creation and was known as the “god without a mother.” In another story, Thoth is self-created at the beginning of time and, as an ibis, lays the cosmic egg that holds all of creation. He was always closely associated with Ra and the concept of divine order and justice. Thoth was credited with creating the art of writing, inventing the calendar, and controlling space and time. Since he was the god of the moon, he had celestial functions and replaced the sun god, Ra, in the sky at night. Thoth helped the funerary deities as a messenger and bookkeeper for them. He was responsible for recording the verdict of the heart-weighing ceremony that determined if the person was able to continue on to the Afterlife. If the person’s heart (spirit) balanced with Ma’at’s Feather of Truth, they passed. However, if the heart was heavier than the feather then the person did not pass. Thoth always provided guidance for the deities and regulated common everyday complaints and created new laws. Thoth suggested that if a problem couldn’t be solved, then a group should get together as an assembly and discuss it. Image: RC 225 Thoth Votive Mummies, Rosicrucian Egyptian Museum.